July and August were not at all the months I expected. With Summer Nationals out of the way and my USA Fencing board term almost over, I’d planned to dig back into my manuscript and stay there for as long as it took to get it into publishable shape. It wasn’t just the zigzagger I swerved to avoid on I-680 on the way home from San Jose. (The zigzagger got away clean, while my car was totaled from clipping the bumper of a pickup truck I was unable to avoid. The occupants of the pickup and I had nice chats with the CHP and our respective insurance companies, after which they continued on their way and I waited—completely uninjured, to my continuing amazement—for the tow truck, who ended up storing my totaled CR-V for four whole weeks before my insurance company, despite my nagging, managed to start the valuation process. But hey, no injuries, no ambulances, so I can live with that.) There were also a few USFA governance issues and some family medical complications, and suddenly there I was, halfway through August and nowhere near where I wanted to be with my book. But then I had the perfect event to put me back into serious crime fiction mode: I was off to Fox Valley Technical College’s Public Safety Training Center in Appleton, Wisconsin, for my first Writers’ Police Academy. After a long day of flying, I wasn’t sure how interesting I’d find a lecture on 3D crime scene mapping, but Joe LeFevre (the FVTC criminal justice department chair who enticed Lee Lofland to bring WPA to Appleton) enthusiastically showed off the school’s Leica C10 laser scanner. 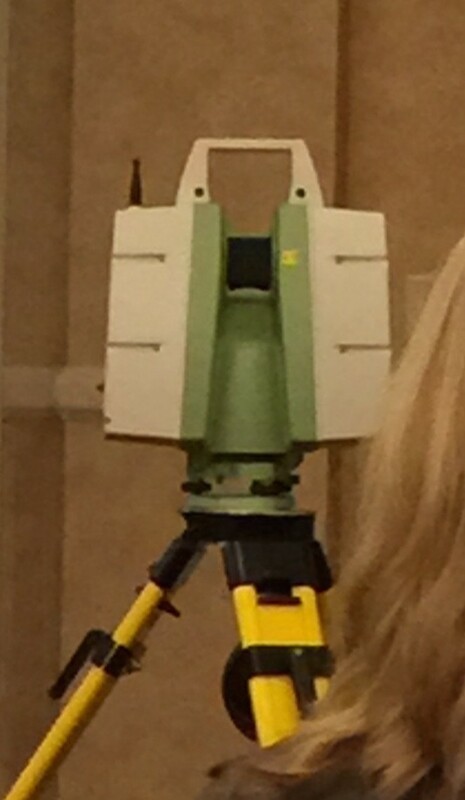 Originally designed for civil and construction engineering use, the C10 is now increasingly used in such fields as archeology and law enforcement to create 3D computer models of scenes. Joe LeFebre explaining the Leica C10’s raw data collection. For crime scene use, the scanner is usually set at 3 or 4 different positions, from which it collects location and color data to create a “point cloud” for up to a 900-foot diameter. At 50,000 points per second, each position takes 3-5 minutes to scan. Once the data is collected and processed, the Leica Cyclone software can create a raw 3D walk-through from the point cloud data, which can be imported into forensic CAD software. Even the raw walk-through can be zoomed in and out, and the point of view can rotate and move through walls to view scenes from different angles. 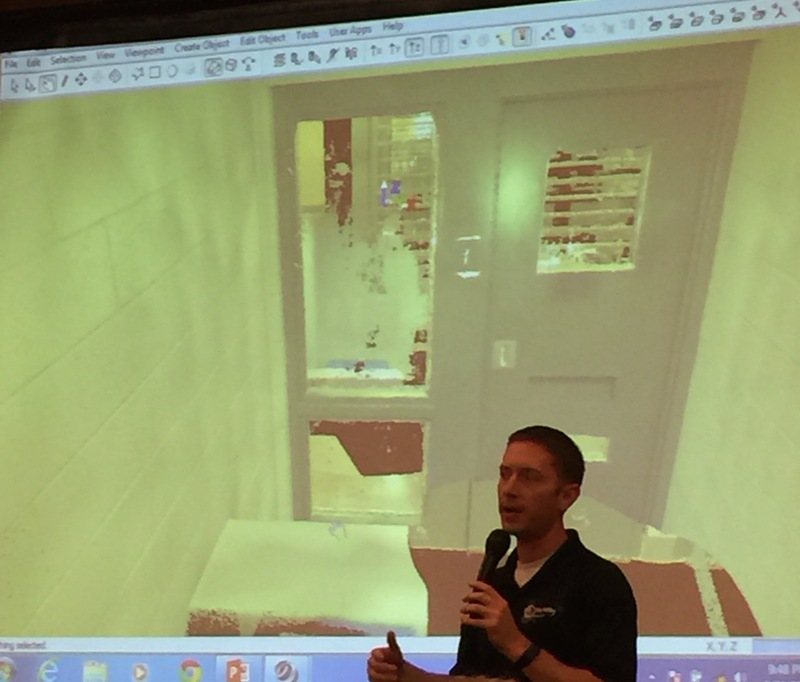 Such 3D crime scene models can be used to test the plausibility of witness accounts of events (such as where shots originated) and for courtroom presentations. Joe also explained some of the work he’s done with others to use photogrammetry on crime scene photos to superimpose objects from those photos onto the 3D models, which can make courtroom crime scene presentations far more useful and coherent than flat photographs. One defining characteristic of WPA attendees became perfectly clear during Joe’s presentation: we were an extremely curious crowd who would keep asking questions for as long as anyone would keep answering them. This caused problems through the entire weekend, because the WPA staff, both FVTC faculty and outside instructors, were happy to keep answering questions for as long as anyone kept asking them. Joe was by no means the first speaker who had to be rescued from both himself and the audience so that some semblance of a workable schedule could be maintained.